Every now and then, one feels the need to get away from the California crowds and lift lines and find a distant, quiet, no-name ski resort with amazing skiing that few have ever heard of. Such a place is Schweitzer Mountain, a resort I recently visited in the northern Idaho panhandle just outside Sandpoint. With 2,900 skiable acres, it is larger than Sun Valley. Boasting some 92 runs and trails, it is the largest ski resort in either Washington or Idaho. Adult lift tickets are only $79 every day. Lift lines are virtually always short in this out-of-the-way spot some 90 miles from the Spokane airport. Schweitzer is in a snow belt that reliably dumps about 300 inches year. Any level of skier or rider can find slopes and runs to their liking. Chutes and faces for the heroes. Long cruisers for the middling crowds. Two wide open bowls to explore. And some of the best tree skiing in the country. The novice area merits special attention. Schweizer has one of the best beginner hills that you will ever find. Conveniently located right at the base on the Musical Chairs lift, it is long, wide, gentle and perfect for bunny skiers. And adjacent to the 2,900 acres of lift-accessed terrain are 4,350 acres of skiing and riding served by Selkirk Powder Guides. They run a cat skiing operation that can take you far into the back country. 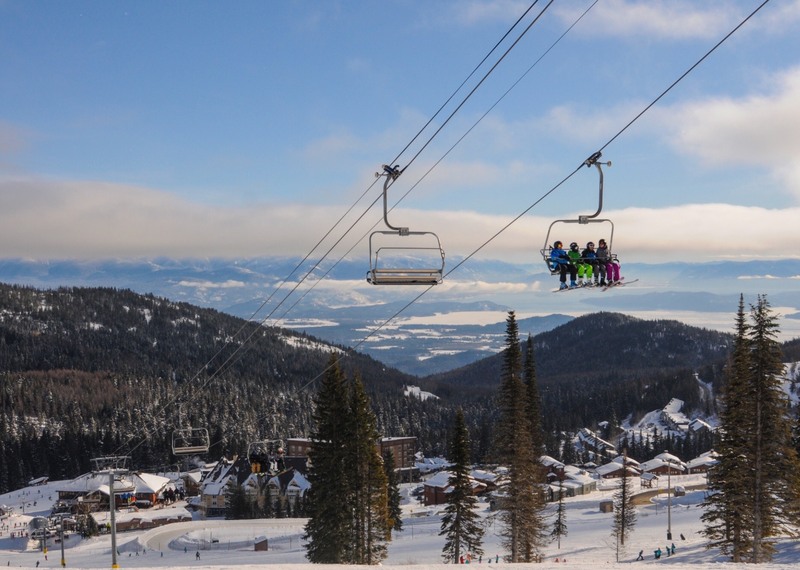 For the nordic skiers in your group, Schweitzer has a superb 32 kilometer network of trails. Two snow tubing lanes are quite the diversion. Or rent snowshoes or a fat tire snow bike. I tried a snow bike with mixed results. The scenery was spectacular. But trying to peddle the bike through six inches of ungroomed snow was no fun. Be sure and wait until the trails are groomed. One could bed down in one of the two large, slope-side lodges at the base – Selkirk or White Pine. Or rent a ski-in, ski-out house or condo. There is a small village at the bottom of the lifts with a handful of cafes and bars. Sandpoint is just 11 miles down the winding mountain road. It is a charming hamlet of 8,000 souls on the shores of Lake Pend Oreille. Scout around town and find about a dozen hotels, motels and numerous restaurants. For chow, some locals have recommended MickDuff’s, Trinity at City Beach and Eichardt’s. One plus about Schweitzer is the low elevation, certainly a benefit for those bothered by high altitude. The top of the mountain is only 6,400 feet. Some Tahoe area resort peaks rise over 10,000 feet. The newish Sky House restaurant sits atop the summit. Sitting on the deck with a cold brew in hand, one can see Idaho, Washington, Montana and Canada.